their authors and/or respective institutions. The South China Morning Post analyzed data from the Transport Department's Annual Traffic Census, which records the number of vehicles on each of the city's roads. 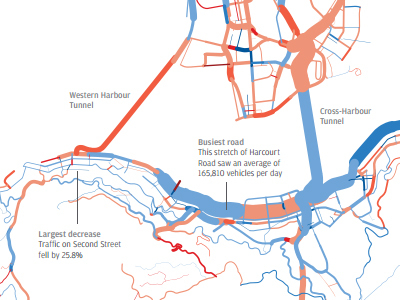 The Post analyzed the data and mapped the traffic levels to understand how the traffic network and tunnels of Hong Kong have changed over time. The thickness of the line reflects the average number of vehicles on that causeway in 2011, while the color indicates percentage change compared to 2010. 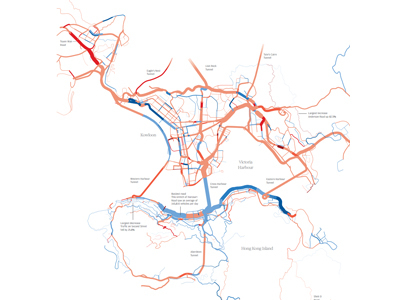 Blue indicates lighter traffic, while red indicates higher traffic. *Note* Before you submit your comment, bear in mind there's no guarantee it will be seen by this project's author. In case you want to contact the author directly, please follow the provided URL.